Adam was baptized in Kirkcaldy’s Old Kirk on 5th June 1723, the only child of Adam Smith and Margaret Douglas. He never knew his father as Adam Smith senior had passed away a few months before on 25th January. His father had been an eminent legal figure from an Aberdeen family of high social status and had worked as Comptroller of the Customs for Kirkcaldy district. His mother was the daughter of John Douglas of Strathenry. Margaret was known to be a devoted mother, who left her son to want for little. His education was begun at home by private tutors, before he attended the local Burgh school, where he was taught by Mr David Miller. Adam went on to attend the University of Glasgow in 1737, where he left with an MA with distinction, before being awarded a Snell exhibition at Balliol College, Oxford. However, disillusioned by his academic life he embarked on an extensive course of self-education, before returning home to Kirkcaldy in 1746. Shortly afterwards he became a lecturer at the University of Edinburgh. He served as Professor of Logic, and Chair of Moral Philosophy at Glasgow University from 1751-52, before accepting a well-paid tutoring post to the 3rd Duke of Buccleuch in 1764. This allowed him to tour Europe where he met Voltaire, Turgot and Quesnay and other pioneers of the French Enlightenment. In the years that followed he would move around, but preferred to spend his time in Kirkcaldy, socialising and enjoying supper parties, for which he became renowned. Using his experience of life in Kirkcaldy as an inspiration, he then completed what many regard as his magnum opus in 1776 – The Wealth of Nations. Throughout his life he resisted calls from the likes of his dear friend, David Hume, to leave provincial Kirkcaldy. Hume considered Kirkcaldy no place for a man of letters, but Smith refused, frequently stating his contentment at living in a small, quiet, provincial town, and the joy he derived from mixing with the townsfolk of all levels. In 1778 Smith was posted as Commissioner of Customs in Scotland, and moved to Edinburgh with his mother, residing in Panmure House. While there he became one of the founding members of the Royal Society of Edinburgh. He died at home on 17th July 1790 and was buried in Edinburgh’s Canongate Kirkyard. 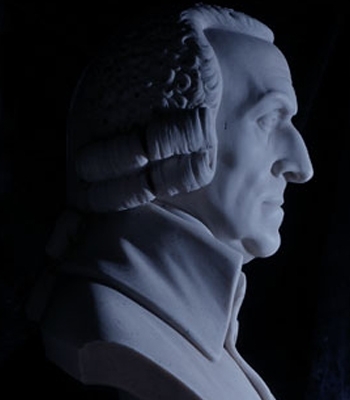 For those interested reading further we recommend Adam Smith: An Enlightened Life by Nicholas Phillipson and The Life of Adam Smith by Ian Simpson Ross.